It took millions of years of isolation and a diverse range of habitats for Australian birds to evolve the way they did. The result is many of the world’s most striking and beautiful birds, including some that are stranger than fiction. In Australian Birds, artist Matt Chun showcases 16 remarkable species that have captured the imagination of the world. This is a beautifully crafted book, superbly illustrated with great attention to detail and colour, which is the perfect introduction to Australia’s unique birdlife. Each of the birds featured is one that will be well-known to many of our students because it will be a part of their environment, but at the same time, will be new to others who live in a different part of the country. Living in the bush as I do, I’m privileged to see lots of varieties on a daily basis, whether it’s the little finches who have just raised a family in their little nest in the honeysuckle outside my window, to the magpie family who bring their babies down to feed and learn each year, the cheeky crimson rosellas who delight in splashing in the birdbaths we have around or the raucous kookaburras who are better than any alarm clock. Children will delight in telling you which ones they already recognise, while it would serve as a wonderful resource to start identifying, spotting and tallying the species and numbers of birds found in your school playground throughout the various seasons and investigate ways that it could be made more bird friendly, perhaps even being involved in the Aussie Backyard Bird Count in October this year. This entry was posted on February 3, 2019, in About Australia, Australian, Birds, Independent Readers, Non fiction, Our World, Review, STEM, Teaching Resource. Stripes in the forest, stealth in the shadows. The last female thylacine tracks through the forests of Tasmania, lands this top predator once owned and roamed at will. But now she watches the strange creatures who are invading the land with their firesticks as they hunt and kill, not caring about the impact they are having on the environment and its creatures. She finds a mate and pups are born, but life becomes ever more precarious. Will she be the last of her kind? The fate of the thylacine (aka the Tasmanian Tiger) has been an enigma since the last one died in Hobart Zoo in 1936, just two months after protection was finally granted in a bid to save them from extinction. Did the pups in this story survive? Were there more to be born? Even today, there are questions being asked and talk of genetic resurrection. Darlinson brings to light the possible story of the final female in this story for younger readers who want to know more about this intriguing creature while McGrath’s illustrations help them imagine a different Tasmania, one that is full of menace and fear as European settlement continues to encroach on the indigenous inhabitants. While Australia has lost 27 mammal, seven frog and 24 bird species to extinction since the first European settlement in 1788, and another 506 species are considered endangered, vulnerable or threatened, the thylacine is the one that has captured the imagination and is the perfect introduction to investigating the concept of extinction and human impact on the environment. Unlike the dinosaurs which were wiped out by a natural disaster, extinction and endangerment is now linked directly to human habitation so using Stripes in the Forest as a starting point to ask why the men were intent on shooting every thylacine they saw and then investigating what happens to both fauna and flora when such an important part of the food chain is gone can be a key part in creating awareness of the need to nurture our environment for our youngest readers. A perfect example of using fiction to lead into an investigation that will go way beyond just the initial reading of the story. Experience has shown that there is great interest in the thylacine but not a lot written for younger readers so this is a must-have for the collection. This entry was posted on April 9, 2018, in About Australia, Australia: Story Country, Australian, Endangered Species, Environment and Sustainability, History, Information Literacy Process, Our World, Picture Book, Review, STEM, Teaching Resource. 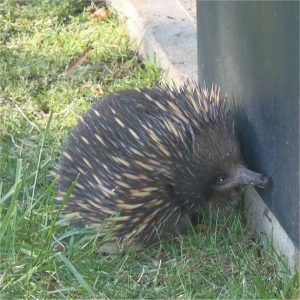 Echidnas are not uncommon in the bush environment from rainforests to dry sclerophyll forests to the arid zones and with their formidable spines and remarkable ability to grip the ground, even hard concrete so they cannot be disturbed, it is no wonder they are are the oldest surviving mammal on the planet today. Knowing that author Jackie French lives in the bush environment in south-east New South Wales, one can imagine her watching an echidna snuffle across her backyard on the trail and this delightful book being born as she pondered its search and brought it to life in rhyme. While Millie continues her dogged pursuit, which is such a steady but remarkably speedy pace, artist Sue deGennaro adds movement and humour in her portrayal of the ants who are as clever as they are numerous. We’ve all seen them carrying food bigger than they are but who would have thought they could manoeuvre four cupcakes and a suite of garden tools!! And in amongst the frivolity there is a lot of information about the benefits of these tiny creatures to our landscape and lives, even if we do see them as pesky annoyances in the sugarbowl! Having endeared us to the ants through these charming pictures, we then discover the reason for Millie’s journey and hearts melt all over again – while a lesson in life is learned. We need food to provide food. Little readers will not only understand echidnas a little more after experiencing this book but they will also view ants in a different light and perhaps take time to observe and think about what the ants are doing before hitting them with a spray or a foot. Extensive teachers’ notes are available as well as a poster but this copy is winging its way to Queensland for Miss Almost 2 just for the share joy and delight of the words, the rhyme, the pictures and her love of stories that is already well-cemented because of tales like this. This entry was posted on May 31, 2017, in About Australia, Animal Stories, Australia: Story Country, Australian, CBCA Shortlist/Notable, Environment and Sustainability, Minibeasts, Picture Book, Preschool, Review, STEM, Story-in-Rhyme. Juliet and her best friend Chelsea love animals, and Juliet KNOWS she will be a vet. Problem is, she’s only ten years old so she has a bit of time before she can go to university and start the study. But she’s getting a head start by helping her mum in her veterinary practice, keeping her vet diary meticulously and making sure her emergency kit is always on hand. Chelsea is also an animal fanatic but her dream is to be a world famous trainer and groomer. In this, the 11th in this series, Juliet and Chelsea are involved in rescuing a variety of creatures after rain has deluged the land and left it flooded. The first task is to get their neighbours’ alpacas to higher ground and while the cria goes willingly on the boat, its hembre (mother) is a little more hesitant. Once that task is complete, they head for home but Juliet is sure she spots movement on an island and wants to stop. However, her mother is anxious to get back to the surgery in case neighbours have brought in any emergencies and so Juliet is left frustrated. She is determined to confirm what she saw and so with the help of Chelsea and her dad (who is afraid of animals, particularly mice) she sets off in Chelsea’s brother’s canoe to investigate. And sure enough, there is a whole menagerie there including mice, lizards, stick insects and an echidna who is struggling to breathe. This is a series that is loved by young girls who love animals and who are independent readers. The combination of strong, independent girls who are “clever, almost grownups” and animals mixed with a touch of humour is unbeatable. It’s written by Rebecca Johnson who is the author of so many of those delightful junior non-fiction titles photographed and published by Steve Parish, and illustrated with cute pictures by Kyla May. Interspersed throughout are excerpts from Juliet’s vet diary which actually include some interesting facts such as those about the alpacas and which could be a model for the other Juliets in the offing. There’s also a quiz at the end of the book that enhances the learning. All the books in the series are listed here. If your library doesn’t have them they are a worthwhile investment because they tick so many boxes for the Year 2-4 reader. This entry was posted on September 5, 2016, in Animal Stories, Australian, Environment and Sustainability, Friendship, Girl Appeal, Novel, Pets, Review, Series. The little wombat from One Very Tired Wombat is back in a new counting book adventure! But this time, instead of being kept awake by all the daytime creatures, it is his nighttime friends who are coming out to play. Hopping mice, quolls, Tasmanian devils, sugar gliders and fruit bats are all there in their nocturnal romp from dusk till dawn until the ten little owls hoot a goodnight tune and signal that the sun is rising and it’s bedtime. So many baby animals exploring their nighttime surrounds under the cover and care of darkness show the very young reader that this is not a time of rest for everyone and that for many creatures once the sun goes down is a time of safety and security. They can speculate about why some animals feel safer at night and learn new words like ‘nocturnal’ and ‘diurnal’, perhaps even seeking to find out more about the creature that most appeals to them. Anticipating how many creatures might feature on the next page is always fun as counting skills are consolidated and confirmed is a bonus. Slightly older children might even do a compare and contrast with One Very Tired Wombat or use this as a model for a class book as they explore what other creatures prefer night to day, where they live and what they find on their nocturnal wanderings. Renée’s exquisite scratchboard illustrations bring each creature to life in great detail and the rhyming texts provides a rhythm that’s going to ensure the little listener will be joining in enthusiastically. For those of you in Melbourne, the book will be launched at The Little Bookroom at 759 Nicholson Street at 3.00pm, this Saturday August 27. More details here. This entry was posted on August 25, 2016, in About Australia, Animal Stories, Australia: Story Country, Australian, CBCA Shortlist/Notable, Counting book, Environment and Sustainability, Maths concepts, Picture Book, Preschool, Review, Story-in-Rhyme, Teaching Resource. To find a safe place to be. The children are so distressed at the waste and rubbish littering the ground, the polluted land and the dry rivers which threatened that habitats of Australia’s creatures that they built an ark to rescue them. Then they travelled around Australia to find the creatures that needed their help most. From the orange-bellied parrot of Victoria to the Spectacled Flying Fox of Queensland to the Gove Crow Butterfly to the native bee of Western Australia, the most endangered of our creatures get on board, all of whom are looking for a safe place to be. Each is listed as ‘critically endangered’, ‘endangered’ or “vulnerable’ according to the Environment Protection and Biodiversity Conservation Act and each has their story and situation described in the pages at the end with illustrations from the NLA collection and other publications. Using the familiar rhyme and rhythm of the well-known children’s song, and beginning with a map of the ark’s destinations around Australia and then a series of clever collages, readers are introduced to some of Australia’s lesser-known creatures and how they are suffering because of human impact on the landscape – a powerful way to inspire a new generation to be more aware and to right the wrongs of previous ones. With Clean Up Australia Day as strong now as it was when it began in 1989 (7092 sites were officially registered for this year’s clean up on March 5) there is clearly an awareness that there is a need to do better if our children’s children are to see these unique creatures. The good news is that in the story the ark sails the seas “for many a day” but eventually can return to our shores because the children have achieved their goal of making the land safe for them again. This is not just a book for pre-schoolers – it has great scope for introducing elements of the Australian Curriculum focusing on human impact on the environment and sustainability. While most are familiar with kangaroos, koalas and our other unique iconic wildlife, telling the stories of the less visible is critical if we are to improve our conservation record. Australia has more than one million known species and a huge proportion of these are endemic to our shores, yet “Australia has the highest loss of mammal species anywhere in the world”. So even though this book was published in 2014 it remains very relevant not only as a springboard to an investigation and community action but also as a model for the students to create their own version of the rhyme or to design a partition in the ark that would meet the needs of their chosen creature. Teaching notes, including blackline masters of the creatures, are available. This entry was posted on March 7, 2016, in About Australia, Animal Stories, Australia: Story Country, Australian, Endangered Species, Environment and Sustainability, Older Readers, Picture Book, Preschool, Review, Story-in-Rhyme, Teaching Resource. In 1875 Ernest Giles is determined to cross Australia from east to west and he knows that camels are the key to his success. Sir Thomas Elder of Beltana Station set in South Australia’s Flinders Ranges is charged with supplying the camels for this new expedition providing the impetus for this award-winning story about an Afghan camel driver’s son, a protected English girl and a small but determined camel named Mustara. Every day Mustara and Taj look out “onto a sea of yellow-red dust and stones. The sand rolls and shifts. Taj’s father says it is like the waves of the ocean and the spinifex bushes are little boats blown about by the wind.” Taj really wants to go with his father on the expedition and is determined to prove that both he and Mustara are capable of undertaking the arduous trip across the desert. However when a sandstorm blows up, he finds himself drawing on all his resources to keep Emmeline and himself safe. An Internet search will yield both background and teachers’ notes for this new paperback edition of the original published in 2006 that will introduce a whole new audience to the remarkable stories of the Afghans and their camels and their place in Australian history. Perfectly illustrated by the masterful Robert Ingpen, it has to be included in your collection for this year’s Book Week theme Australia: Story Country because it is part of the story of our country. This entry was posted on January 28, 2016, in About Australia, Animal Stories, Australia: Story Country, Australian, History, Identity, Picture Book, Teaching Resource. This entry was posted on December 11, 2015, in Animal Stories, Australian, Christmas Countdown, Christmas Story, Picture Book, Preschool, Review, Story-in-Rhyme. This entry was posted on December 8, 2015, in Animal Stories, Australian, Celebrations, Christmas Countdown, Christmas Story, Picture Book, Preschool, Story-in-Rhyme.